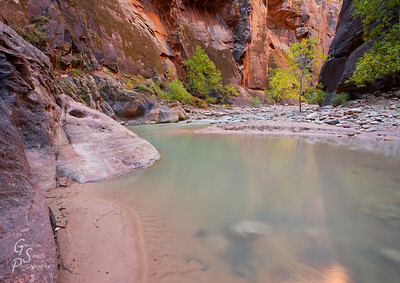 Zion National Park landscape photography is dear to my heart and close to my home. 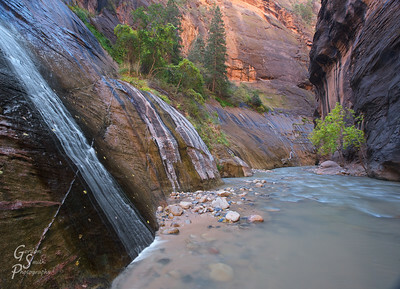 I live only a 40-minute drive from Zion National Park and find my way over there many times a year: for a morning hike, an overnight campout, a day-trip, and sunrises (my favorite!). I feel extremely fortunate to have this beautiful place so accessible. Some of the great places pictured here include: Tower of the Virgin, Zion Narrows, Subway hike, Kolob terraces, Kolob Arch, Spry Canyon, and several other unnamed but spectacular sites. Because I go there so often, there are several pictures from several areas in this park. The park is very large. More recent pictures are near the beginning. Please see the Subway Canyoneering Hike report and pictures for this particular section of Zion and the adventurous trip that it is. 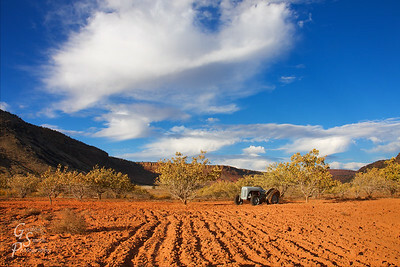 Shadow, Furrow, Autumn Leaves, Broken Tractor: Everything delays, ages, degenerates. In this case, the declines is beautiful, scenic and wonderful. 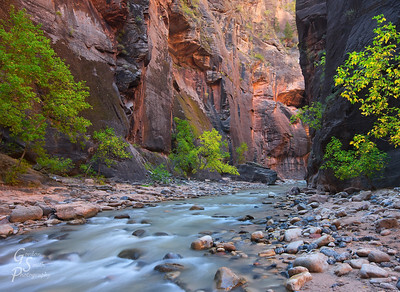 Zion Moment in the Narrows under a yellow cottonwood and beside the Virgin River. 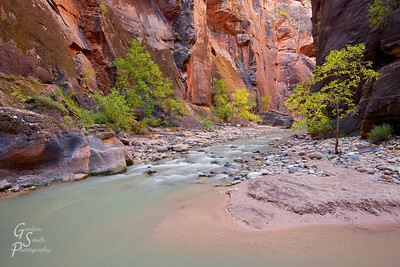 Upstream to the Narrows and surrounded by autumn trees and the tall canyon walls in the Narrows of Zion. 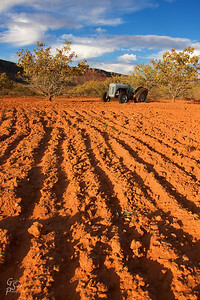 Big Cloud and Empty FarmBig Cloud and Empty Farm A huge and beautiful cloud hovers above empty farm fields and a broken rustic tractor. 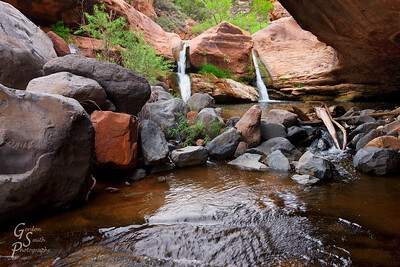 Virgin River and Mystery Canyon waterfall join in the first mile of the Narrows hike. Trees and high canyon walls make an enchanting experience. 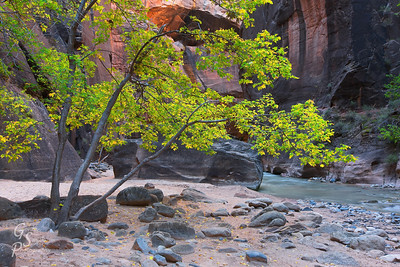 Zion Autumn in the Narrows with a gorgeous big cottonwood tree in wonderful yellow color! Glowing beautiful sandstone cliffs surround the river. Zion Narrows Hike up the canyon and in the Virgin River. Unmoveable Rock sitting half in the water and half on land. You can hike hike around on the left side or swim around on the right. Golden high canyon walls are beautiful! 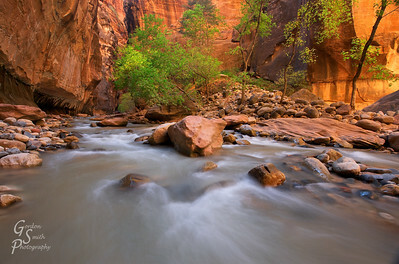 Golden Canyon Walls, Zion Narrows acheive spectacular colors of orange, gold and red during the morning hours. 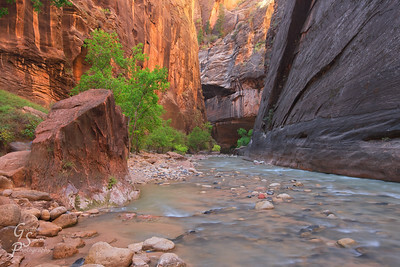 Here a rivulet of rocks and water spread out in the canyon. Autumn Trees in Virgin River Narrows are yellow, green and stunning. 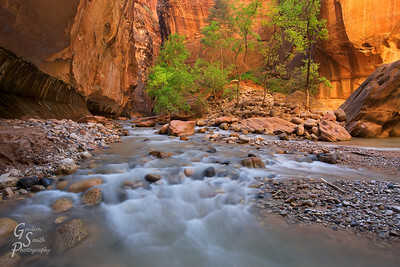 The river curves coolly through the rocks as orange reflected light falls into the canyon. Narrow Light out of the Canyon leads hikers back to the trailhead after a wet hike through this lovely world. 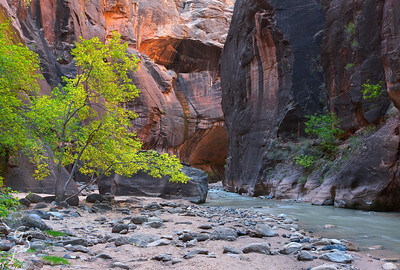 Beauty of Zion Narrows captured in a small section where a green tree overhangs the rocky river. 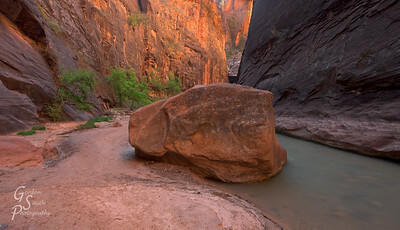 Rocks in the Zion Narrows endlessly trip up hikers. 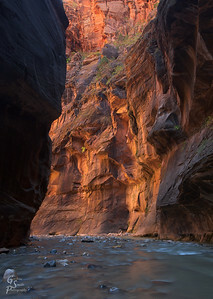 They also reflect lovely golden red light from the higher canyon walls. A grove of green-turning-yellow trees stands beside the river. 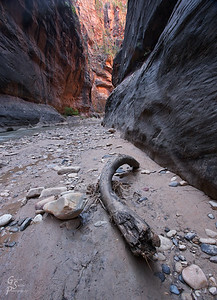 Twisted Log along Virgin River Narrows probably left after the most recent flash flood. Pine needles and other river debris lay around. November 2015: Gregory Butte Peak and La Verkin Creek Just after sunset, I stood beside La Verkin creek and photographed autumn leaves and Gregory Butte peak. 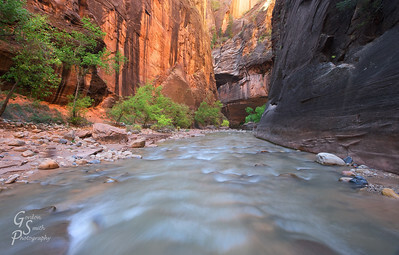 The Kolob canyon section of Zion national park is renown for its' majestic scenery. 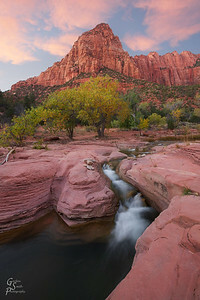 Zion Eden Zen are just a few words the spring to mind contemplating the Zion Narrows in autumn. 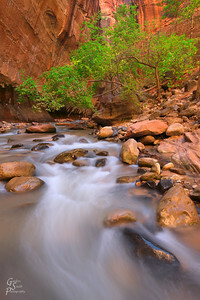 The waters are smooth and cool, the trees prepare for winter and orange light glows throughout the canyon. 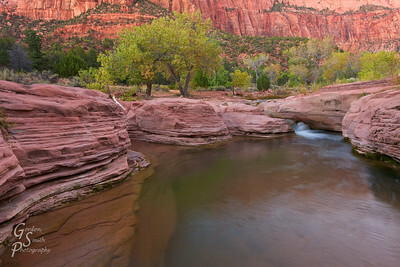 Serenity Pool deep within Zion National Park. Although it's a 4.5 mile hike to visit, the beauty and solitude are unforgetable. Arrive in Paradise approaching this split double waterfall after a long day hiking in Zion national park is a welcome site. This wonderful oasis is fantastic for scenery and swimming.